2 LOTS SIDE BY SIDE! Price includes both lots. 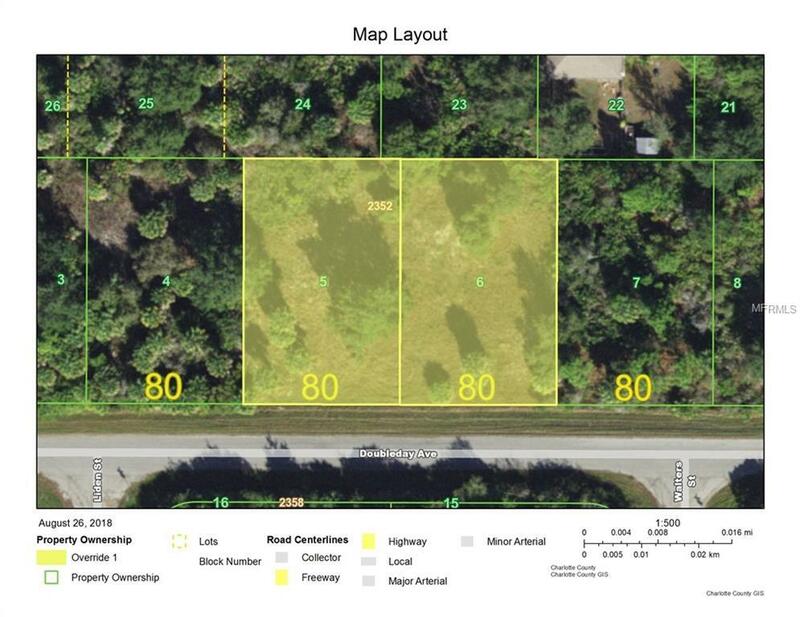 Build that dream home in a great location between North Port and Port Charlotte. Minutes to boating, fishing, restaurants, shopping, and schools. Within 30 minutes to the blue water beaches of Manasota Key and Boca Grande. Start living the Florida lifestyle in a custom home built just for you. I will gladly introduce you to a builder that can help you make this dream come true. No HOAs, CDDs or deed restrictions! AREA INFO: The Port Charlotte area was VOTED #1 PLACE TO LIVE by CNN and MONEY magazine and featured in the TOP PLACES TO RETIRE in WHERE TO RETIRE magazine. Port Charlotte Beach Park is a public beach facility at the southeast end of Harbor Boulevard and offers, a sandy beach, outdoor heated pool, boardwalk, volleyball courts, fishing pier, boat launches, and picnic shelters. Port Charlotte is located on the Gulf Coast of Southwest Florida, approximately 4 miles southwest of 1-75 off Exit 170 and features EASY ACCESS TO WORLD CLASS FISHING IN CHARLOTTE HARBOR AND THE GULF OF MEXICO. By sea, Port Charlotte is located on Charlotte Harbor about 30 minutes by powerboat from Port Boca Grande on the Gulf of Mexico. There are more than 24 public and semi-private golf courses within the greater Port Charlotte/Punta Gorda area which is conveniently and quietly located approximately 50 miles south of Sarasota, 24 miles north of Fort Myers, 125 miles from Orlando and Disney World.